Delaware Christian’s Curtis Bean, front, battles for a rebound with Danville’s Corbin Hazen (12) and Dylan James (3) during the first half of Tuesday’s non-league showdown in Delaware. Delaware Christian’s Isaac Rindfuss (1) puts up a mid-range jumper during the first half of Tuesday’s game against visiting Danville. The Delaware Christian boys basketball team couldn’t overcome the tall odds it faced Tuesday night. 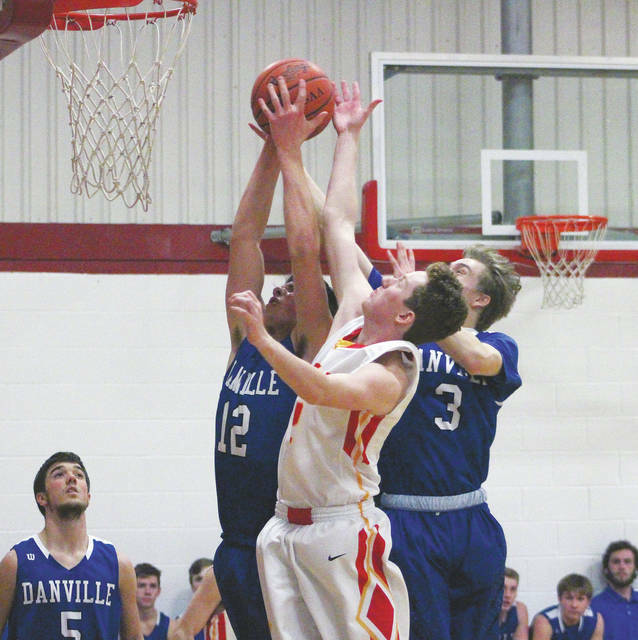 The Eagles just didn’t have the size to contend with a quality big man the likes of Danville’s Skylar Durbin, who scored 30 points, including 10 in the third quarter to help the Blue Devils roll to a 70-56 win in Delaware. Danville used a 10-0 run in the second quarter, including four Durbin free throws and a basket, to go up 14. The Blue Devils led 43-29 at the break. John Comer scored five points during a 7-0 run in the third that helped the Eagles close to within 49-38. “I’m actually pretty encouraged tonight – I just don’t think we had the horses to play with them at this point … eventually we will,” Landrum said in reference to Nathan Stewart, Ike Hedges and Pryce Johnson – who are each out for various reasons. But, two quick Skyler Moore buckets started a 9-2 run for Danville and DCS never threatened again. Dylan James knocked down three three-pointers and finished with 15 points, Moore added 11 and Corbin Hazen chipped in eight points for the Blue Devils (4-2). Isaac Rindfuss led with 15 points, Curtis Bean came off the bench and scored 12 points and Ryan Manny added 10 for the Eagles (1-8). Next up, DCS is back in MOCAL action Saturday night at Gahanna Christian. 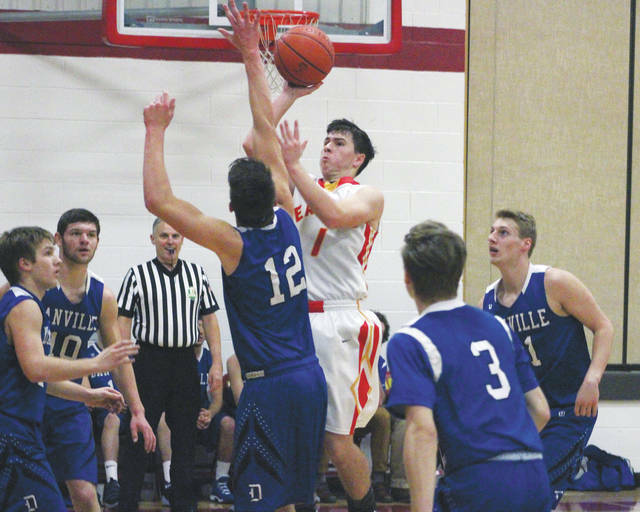 Tip is scheduled for 7:30 p.m.
Delaware Christian started well, but a rough third quarter proved to be too much to overcome en route to a 45-36 loss to host Northridge Tuesday night in Johnstown. The Eagles (1-5, 0-3 MOCAL) led 8-6 after the first quarter and 18-11 at the break, but Northridge used a 20-4 third-quarter surge to take control. Both teams scored 14 points in the fourth to smooth out the scoring summary. “They came out real aggressive on defense in the third quarter and we just didn’t handle it well,” DCS coach Jackie Boggs said. Delaware Christian’s Lyssi Snouffer led all scorers with 24 points. She also had 15 rebounds and three blocks in the setback. Other DCS scorers included Anna Fuller and Hannah and Abbi Maurer, who finished with four points apiece. Abbi Maurer had eight rebounds to go with her points while Erin Bauslaugh chipped in a team-best three assists. DCS returns to action Friday against visiting Northside Christian. Tip is set for 6 p.m.
https://www.delgazette.com/wp-content/uploads/sites/40/2018/01/web1_dcs.jpgDelaware Christian’s Curtis Bean, front, battles for a rebound with Danville’s Corbin Hazen (12) and Dylan James (3) during the first half of Tuesday’s non-league showdown in Delaware. https://www.delgazette.com/wp-content/uploads/sites/40/2018/01/web1_rindfuss.jpgDelaware Christian’s Isaac Rindfuss (1) puts up a mid-range jumper during the first half of Tuesday’s game against visiting Danville.